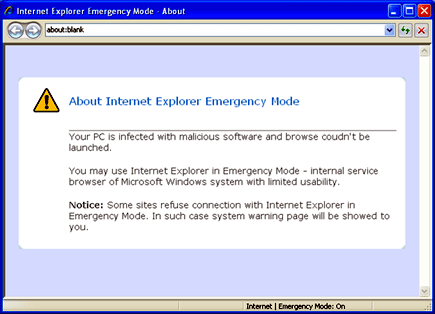 What is Internet Explorer Emergency Mode? Your PC is infected with malicious software and browse couldn’t be launched. You may use Internet Explorer in Emergency Mode – internal service browser of Microsoft Windows system with limited usability. Notice: Some sites refuse connection with Internet Explorer in Emergency Mode. In such case system warning page will be showed to you. What are the Symptoms of Internet Explorer Emergency Mode Infection? 1. Print this procedure as we need to close all programs running later. 2. Download MalwareBytes’ Antimalware here and save it to your Desktop. 3. Close all open applications. 5. Run the installation on the default settings. No changes are necessary. 6. Just before completing the installation, make sure that the following are marked check. 7. MBAM will run and update itself after installation. Close MBAM after the update. 9. Click on the MBAM icon and start to Perform Full Scan to begin scanning your computer for “Internet Explorer Emergency Mode” related files. 10. After scanning, a message will appear stating that the scan is completed successfully. Click OK.
11. Click Show Results and detected threats will be displayed. 12. Make sure that all threats are marked check, then click Remove Selected to begin removal of the malicious files. 13. Exit MalwareBytes’ AntiMalware and restart your computer. 14. “Internet Explorer Emergency Mode” and all its files are now removed from your computer. To protect your computer from this threat and avoid future infections, you may want to obtain a Full Version of MalwareBytes’ AntiMalware. No response on "Internet Explorer Emergency Mode"
im-infected.com · © 2010 · All rights reserved.